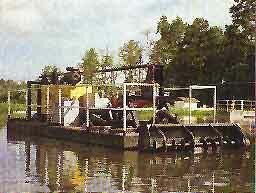 The LWT PIT HOG 724MAU Self-Propelled Dredge (SPAD) is capable of being driven by a propeller. The travel mode is selected between the cable drive and the prop drive, whichever best meets the needs of the project. Use of the prop drive allows the dredge to operate in irregular lagoons, ponds or waterways where cables cannot be easily or effectively used. The control system utilizes a high-pressure hydrostatic transmission to power and control the speed of the large diameter, low speed, high thrust propeller unit. The control system also includes an anti-stall system to make certain power is available to the pump and propeller functions during operations. Liquid Waste Technology, Inc. (LWT), 422 Main Street, PO Box 250, Somerset, WI 54025. Tel: 715-247-5464; Fax: 715-247-3934.